The space you work in everyday impacts the way you work and operate. Inject local art into your space to inspire employees, instill creative culture, and support Cincinnati artists. CORP. [Creative Outreach Partnerships] is a curated visual art program that enables businesses to have original art displayed in their office spaces while directly supporting the artists that live and work in Cincinnati. We curate exhibitions that fit your business’s needs and work with you directly to make sure that the art that goes into your space is reflective of your goals, mission, and aesthetic. To schedule a preliminary appointment, email wavepoolgallery@gmail.com or call (513) 600-6117. Chase Melendez at 1628 Ltd.
Valerie Allen at 1628 Ltd.
Cincinnati is home to some incredible visual artists, many of them quite prolific. However the amount of people who purchase art is disproportionate to the amount of art produced, resulting in artist studios filled to the brim with amazing artworks gathering dust. This program aims to solve this issue. CORP. curates 4–12 month long exhibitions in business offices around the city. The artists who participate will receive a fee for exhibiting their work and the works will also be available for sale. Businesses who are interested will meet with the Wave Pool curatorial team and steer the aesthetic vision for what will go in their exhibition. Wave Pool does not have a ‘stable’ of artists to choose from. Rather, we use our expertise and knowledge of artists in Cincinnati to curate exhibitions based on each specific business’s vision. 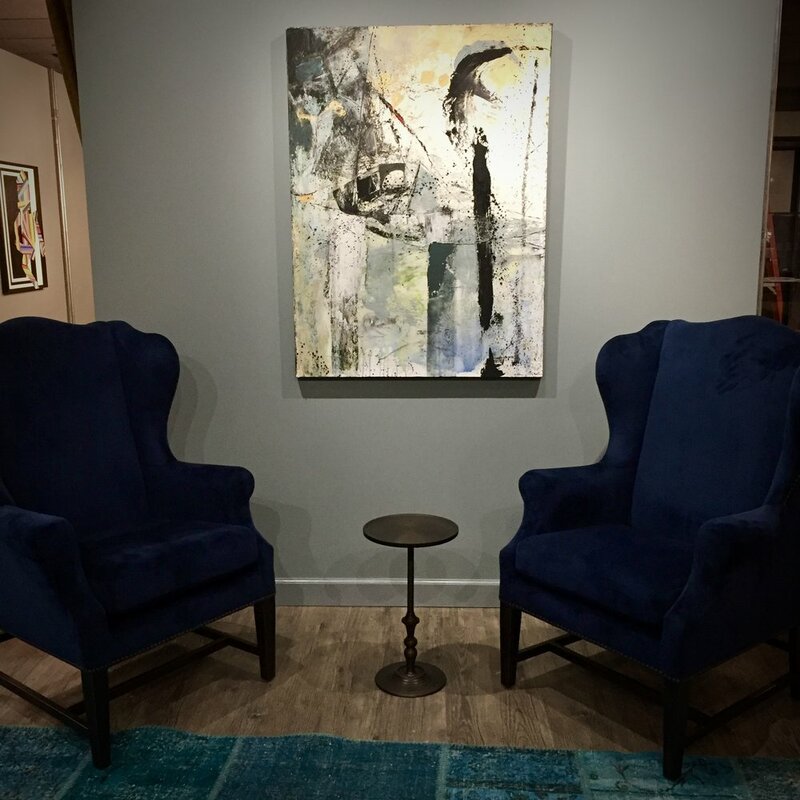 We are happy to curate a show that fits your business’s needs and works with you directly to make sure that the art that goes in your place of business is reflective of your priorities, goals, and mission. Denise Burge at 1628 Ltd.